– Discover them now with our new filter functions! Did you know that StockFood’s portfolio includes the images of about 100 international food bloggers? And that number keeps climbing. Food bloggers are always on trend and have a distinctive style when it comes to staging food. We live in a day and age where their voice is profound. Their success on Instagram is instant proof that they are able to communicate with a fresh visual language and distinctive style. Since they are so intertwined within the community, it should be no surprise that food bloggers have become more and more important to the food photography industry. Our trend scouts watch the scene and work regularly with food bloggers at events to find the best blogger images for you. The days when you had to visit and search individual blogs are over. Our Food-Blogger Collection includes the best-of-the-best of international food bloggers. They stand out for their creative visual language and modern themes. Dive in and be inspired by our vast portfolio of blogger-style images. 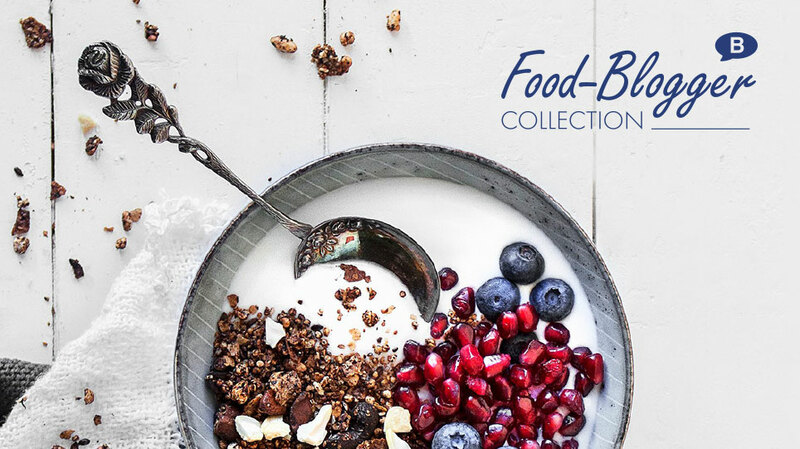 With our new functions you can find the Food-Blogger Collection even faster. Discover new images in a fresh style. If you are a blogger or would like to work together with food bloggers – use our professional blogger network. Get in touch with us. 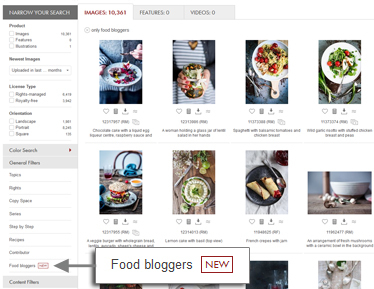 Use the filter at the image search to get directly to the food bloggers. You’ll get the complete portfolio of our food blogger images. Are you looking for images from a specific blogger? 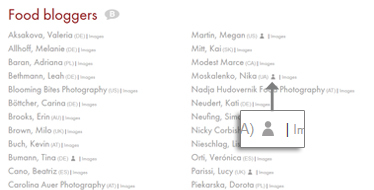 All of our bloggers are listed alphabetically by name to make your search simple and easy. 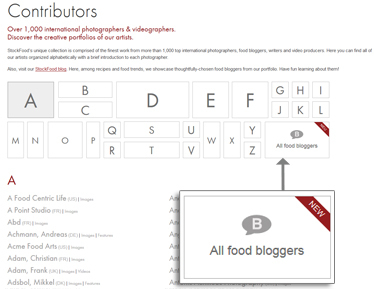 Within the category Contributors A-Z you’ll find all food bloggers sorted alphabetically! From here you can click further to view the bloggers portrait, images, or features. For several food bloggers we also publish background information. You can learn interesting details about the blogger themselves. This symbol reveals that there’s more to know!